From the day he was born and made his egg shell disappear with a sneeze, everyone knew that Hocus P Diplodocus was the world’s first ever magician. As he grew his tricks became better and better. He could make things disappear and even rescue his friends from a scary Tyrannosaurus Rex. He could do amazing things, but those sneezes still caused problems sometime. When Hocus puts on a magic show for his birthday to entertain his friends, will it be a wonderful success or a sneezy disaster? The text is entertaining with enough silly fun to have preschoolers giggling. If your children are anything like mine, Burpy Barosaurus suggesting that the ‘P’ in ‘Hocus P Diplodocus’ could stand for ‘Pimplebottom’ is sure to raise a laugh and a request for the story to be read again. (Fortunately, Hocus comes up with the much better suggestion of 'Pocus' - the perfect name for a magician). 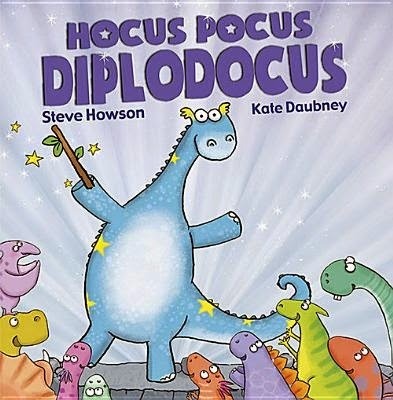 With cute, colourful illustrations and a fun story, Hocus Pocus Diplodocus is sure to be enjoyed by young dinosaur fans. Kids will love Hocus’ tricks, both the intentional and sneeze-induced ones, and they just might discover why there aren’t any dinosaurs anymore.